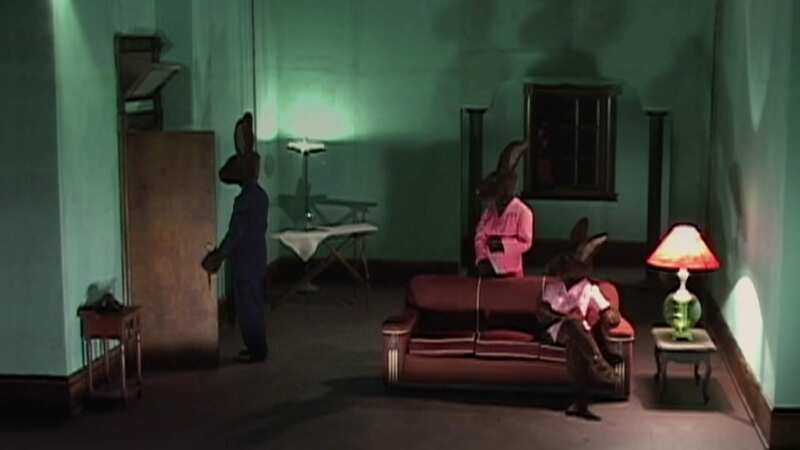 Rabbits is a dark and mysterious series of short films by David Lynch, featuring three performers wearing rabbit costumes and delivering disjointed dialogue punctuated by lengthy periods of silence. As you can probably tell, this is definitely at the ‘experimental’/’arthouse’ end of the entertainment spectrum and probably not an easy watch for many viewers. The fact that this series has been used in a psychology study to induce a state of existential crisis speaks volumes. But for those who stick with it, these mini-movies serve up a perfect Lynchian experience full of dread, mystery, supernatural intrusions, fear and a dreamlike atmosphere like nothing else you have ever seen. 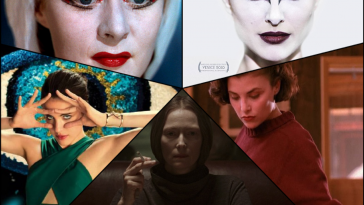 The fact that Lynch is able to create such impact in such an abstract and deconstructed way, says a lot about his skill as a film maker and story teller. 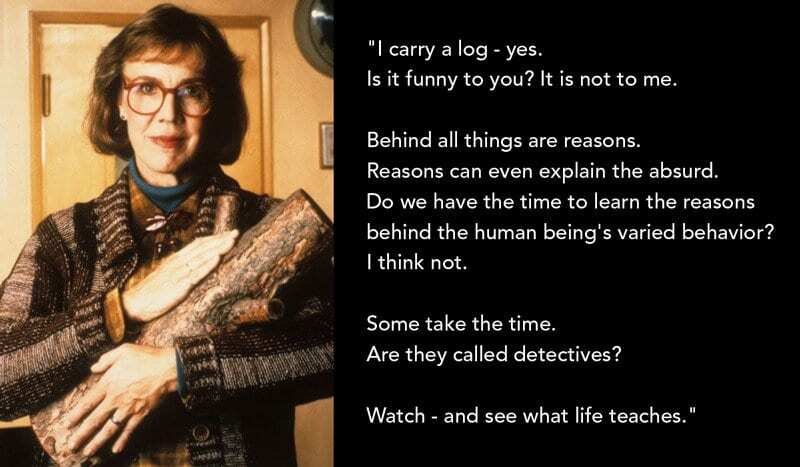 In typically deadpan fashion, when interviewed, Lynch described the work as “a nine-episode sitcom”, a description that completely fails to capture the unnerving, powerful experience that is Rabbits. 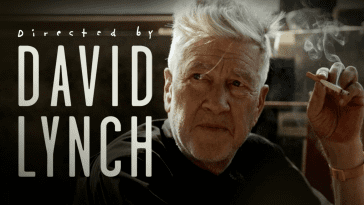 The videos were originally released in 2002 to subscribers of the now defunct DavidLynch.com. They were immortalised on DVD as part of the 10-disc Lime Green Set, which now changes hands on Amazon for crazy money , and scenes from the series were re-shot and incorporated into Inland Empire. If your interest is piqued by this article, you may also find the entire series available to watch on more than one popular video streaming platform. The first thing that strikes the viewer is the set – a single room, captured with a single fixed camera, much like a film of a play, or a television sitcom. The entire world in which this story is told comprises a small apartment living room, with a couch and two doors – one to the hallway outside the apartment and another to, presumably, a kitchen. Into this room come three rabbits. Two are female – one who sits on a sofa (Jane, played by Laura Harring), the other placed upstage, often at an ironing board (Suzy, played by Naomi Watts). The third rabbit is Jack (played by Scott Coffey), who enters and exits through the apartment’s front door and generally sits alongside Jane on the couch. The rabbits move and speak slowly, with prolonged pauses punctuating the action. They deliver dialogue in deadpan voices without much expression or inflection. And their conversations do not flow. It feels like the lines, taken as a whole, might tell a coherent story – but they are delivered in an apparently random order, creating a bewildering and disorientating effect not unlike the cut-up experiments of the surrealists and authors such as William S Burroughs. Adding to the strange impact of the deconstructed dialogue is a laugh track which punctuates the disjointed conversation occasionally at apparently arbitrary moments. The unseen audience also whoops and cheers for lengthy periods when actors enter the stage – as though we’re watching an episode of Cheers filmed in front of a live studio crowd, only it’s super-weird and full of rabbits. The action is, per the description above, extremely stylised. It is the opposite of Stanislavskian naturalism. Everything about Rabbits seems designed to prevent the audience becoming comfortable or losing themselves in the fiction onscreen. These techniques are reminiscent of Brechtian alienation in theatre, disrupting the illusion and distancing the audience. And yet, perhaps surprisingly, this deconstructed experience, with its lack of exposition or discernible plot, still conveys a mood and a mystery that draws the viewer into a compelling viewing experience. Accompanying the stilted action is an eerie soundtrack punctuated by percussive booms, which seem to momentarily shift the camera out of focus. A score of synthetic strings, written and performed by Angelo Badalamenti, shimmers and pulses under the dialogue, building an air of unease. Distant foghorns and lashing rain effects drift across the music, adding to the intense atmosphere. 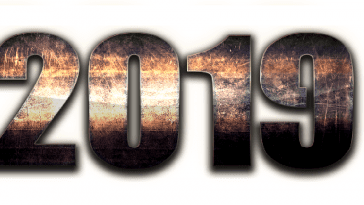 Despite the abstract nature of the script, there are recurring themes within the dialogue and a strange poetry to many of the lines – especially in the occasional monologues delivered by the characters. Times and dates, along with confusion about the time are mentioned again and again, often followed by audience laughter – as though the very concept of marking time is a joke. There are recurring references to Jack Rabbit keeping a secret. A knocking is heard from the hallway on several occasions and at one point a telephone call is received. Twice during the series, a supernatural entity called ‘Red Rabbit’ appears in the apartment and speaks in a strange, incomprehensible tongue. All of this manages to create a coherent Lynchian tone and stops the series descending into complete impressionistic confusion. 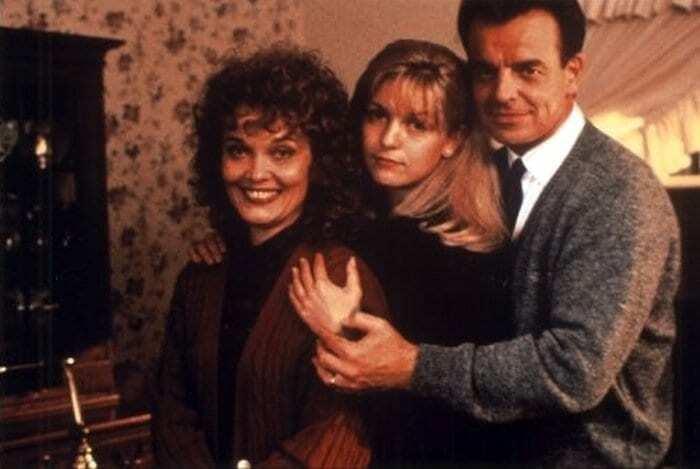 But for all the laugh track and set stylings, this is far from your average sit-com – no matter what Lynch says. In fact, if it is reminiscent of anything else, in my opinion it is the ancient Japanese tradition of Noh theatre. Like Rabbits, Noh theatre is minimalist, slowly paced and staged so that small actions take on great significance. The performers wear masks and thick costumes that de-emphasise the actor’s presence. In Noh theatre, little effort is made to create an illusion of reality or to preserve a suspension of disbelief. Instead, Noh performances are extremely stylised and stage hands are visible on stage throughout, because it is a form of theatre comfortable with the audience knowing that art is being created before their eyes. It has no interest in creating a convincing illusory reality. All of this is also true of Rabbits. Another concept important to Noh theatre, and all traditional Japanese art forms, is Ma – the profound application of space or stillness. In painting, as with the image above, this means conscious use of empty canvas. In Noh, and in Rabbits, this technique manifests in moments of unnatural stillness, in which the actors hold poses and maintain silence – allowing an immense presence of meaning and feeling to grow and flourish in the vacuum they create. 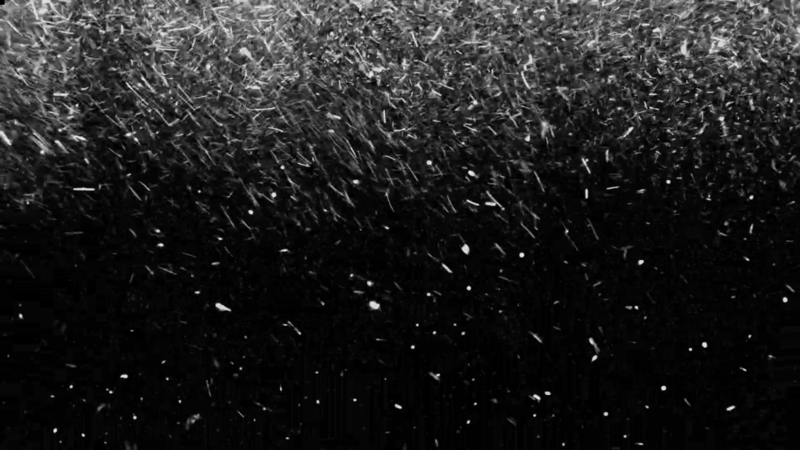 And this empty space is where the power of Rabbits is generated – in between the words, in between the actions, in the absence of a coherent plot. The unnatural, uncanny presentation style creates a creeping, growing dread that becomes heavier and more intense as it is given more space to breathe. On paper, Rabbits might seem like a silly or comedic concept, as the use of a laugh track might suggest. 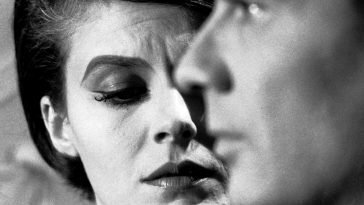 But the actual experience of viewing these nine episodes is to be unsettled, challenged and occasionally frightened by a form of pure atmosphere with no context. I wasn’t kidding when I said the series had been used by scientists to invoke a state of existential dread in study participants, that really happened, and when you watch these strange videos you will see why they chose this work. Rabbits won’t be for everyone. It is unrepentantly arty and challenging. It is deliberately difficult. It is a puzzle without a solution. But none of this stops it being one of the most powerful viewing experiences you will ever have. The imagery and presentation manage to bypass the intellect and work directly on our emotions, manipulating the viewer to feel, rather than think. 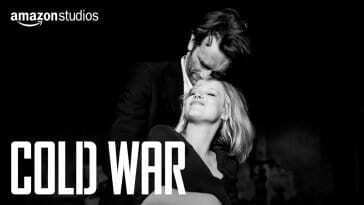 This is a visceral, rather than a cerebral experience. It is like main-lining Lynch, straight, no chaser. So brace yourself, draw a deep breath and get ready to plunge headlong down the rabbit hole. PS – No spoilers, but I was struck by parallels between the closing minutes of Rabbits and the final moments of The Return. I’d be keen to hear what you think it all means! Hit me up on Twitter and share your thoughts – or or join the conversation with 25 Years Later on Twitter or Facebook. I really like what I’ve seen of Rabbits. Unfortunately my only exposure has been watching Inland Empire which I just re-watched 2 days ago for the 5th time. 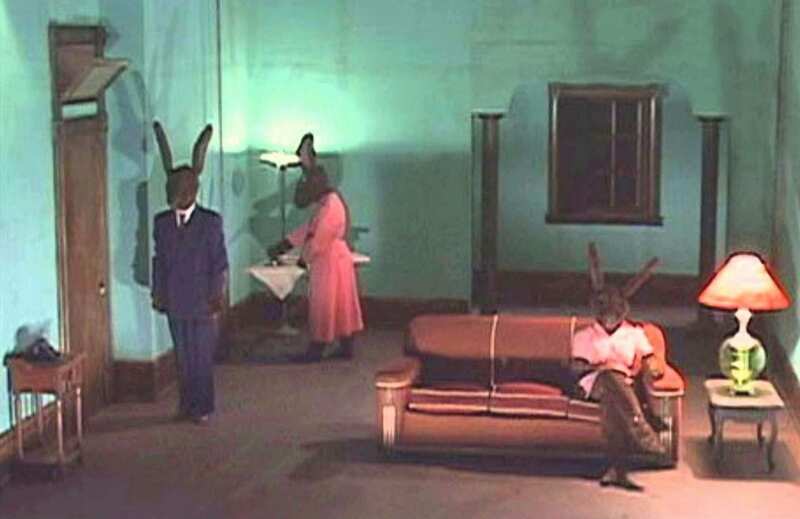 I recall seeing Inland Empire in a theatre somewhere around 2006 (I think) and was blown away by the Rabbits sequence and trying to find out more about it. You mentioned it’s available on some streaming services. Any hints? It must be one of the serious film channels. Thanks for the essay! Another classic Japanese art form is the Bunraku puppet play; in live productions, puppeteers dress in black to restrict the focus the audience to the puppets. The compelling film “Double Suicide” is done in the Bunraku form and its director, Masahiro Shinoda, utilizes visible, anonymous figures in black to manipulate the actors, whose fates are destined for tragic ends. The evocative use of BW and stylized elements, including extended periods of silence, in TPR has more than once stirred memories of Japanese film, both traditional and experimental.